If Caesar was a fashion blogger and a girl, he might’ve opted for this headpiece. Okay fine, maybe not. But isn’t this headpiece a beauty? It came all the way from this jewelry store in London called Eclectic Eccentricity. Like this headpiece, most of their jewelries are made using vintage trinkets so each piece has a story to tell. It’s no surprise that a number of celebrities like Gwen Stefani, Selena Gomez, Eliza Doolittle and Paloma Faith have all been photographed in Eclectic Eccentricity jewelry! I’m in good company haha! As you can see, I got really inspired by the vintage feel of my headpiece which is why hippie Camille got resurrected! I can already see it–hippie Camille frolicking in the meadows, hugging trees and playing the ukelele. Haha! From my sheer beaded top to my gold arm candy, I made sure each piece had that romantic vintage look. I’ve said this before and I’ll say it again, watches aren’t just for functionality. I’m sure most of you like to multitask like me. We do so many things and try to achieve as many as we can like there’s no tomorrow. Time is definitely essential and we can not go by a single day without getting all time-conscious. Needless to say, I understand how important and convenient it is to have a watch with you at all times, but that doesn’t mean they should become eyesores. They don’t have to ruin your outfit. Gone are the days when you have to sacrifice style for function. Watches are great accessories too! I mean take a look at my Axis watch. It goes so well with my beaded armcandy! Axis lets you express yourself and make a statement through their unique watches. They offer a wide variety of designs to suit your personality and outfit without burning a hole through your pocket. How much do you think does my watch cost? Even with these pretty stones, it’s actually still very affordable! So what are you waiting for? Get your very own Axis watch and make your time count, fashionably! Is this in valle verde? It’s around 2k :) Thanks Rosey! Finally someone created a caesar headpiece. I’ve been wondering if it was possible to make such thing. Hehe. Lovely! Can you help me like my picture here on.fb.me/LiwUmT for a contest in Brunei. Thank you! Thanks Jasmin! Good luck with the contest! Hi Camille! Can you please suggest an outfit inspired by the 70’s? Thanks a lot. Flared jeans! Watch That 70s show! Or the old Charlie’s Angels! I absolutely love the accessories you used for this look. Gold always looks amazing! Awww thanks Jing! I graduated from Ateneo with a degree in BS Management :) I will! I think single pieces are strangely matched together, but I love your clutch and your top. Pretty! You look like a goddess. Awww thanks Charisse! I love gold! Why are you so lovelyyyy!!! You really can wear everything. i love your headpiece, it reminds me of how beautiful the outfit of the goddess in Greece ^_^. im super fan of yours. Thanks Janz! It’s always about knowing what suits your body type best! Just do little tweaks here and there to accentuate your assets and hide your flaws :) You can do it! hey camille, i really love your style esp when it comes to stylish edgy corporate looks. This is insane beauty! LOL. Seriously, very lovely! :) And very stylish, still. it’s either before or after my graveyard shift, I make sure to check on your posts. you look great Camille. as always..
Love gold!Your headpiece is so special!It suits you perfectly! well, you are now the roman empress! you look so lovely and I am in love with your accessories! you should make an accessory collection post! And pardon me for asking, but is that the compound where you live? such a beautiful headpiece! and the entire outfit is ethereal. LOVELY! I just had to take a break from thesis and post a comment on this. Maybe if I try this outfit myself, people will think that I’m so weird and crazy. I just love how versatile you are miss Camille! Everything looks good on you! I love it. I love youuuu! 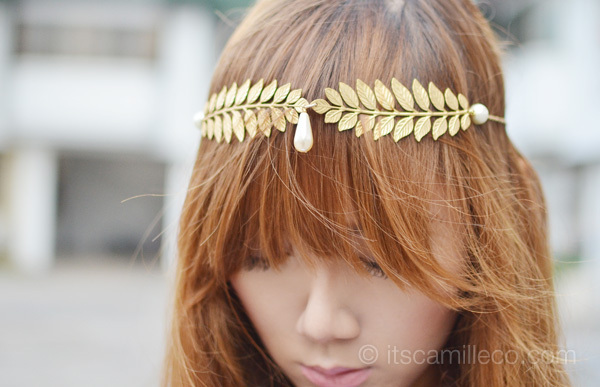 :”> Plus, I really love the gold accent especially your watch and headpiece! You look like a godess! so lovely! it’s like you are awarded as laureate in fields of fashion with that headpiece:) pretty! Another lovely outfit! 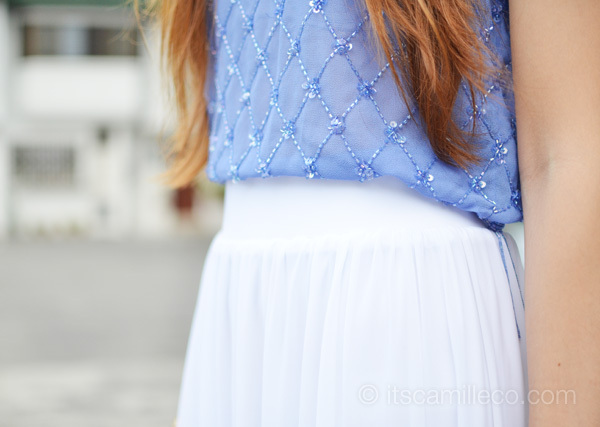 Did you wear high heels to go with your maxi skirt or just flats? You should have shot this look in a dramatic location! Maybe near a cliff haha! And I also love how you always incorporate a watch in your outfit!